The historical long standing two schools Prince and Princess of Wales Colleges stand majestically by the side of the Main Galle Road, Rawatawatte, border being behind the lagoon are a gift of the Great Philanthropist late Charles Henry de Soysa, Justice of the Peace in 1876. He was the only son of Gate Mudaliyar Jeronis de Soysa. He was born on 3rd March 1836. He had his preliminary education at the Palliyagodella Temple School thereafter continued his further studies with Rev.MacVicker, Vicar of the Presbyterian Church, Dehiwala and was a boarder at St.Thomas’ College, Mutwal. He was taught the value of agriculture by his father and horse riding. Being a young man in his teenage he was helping and assisting poor in Kandy and Moratuwa equally. At twenty one years of age he knew a lot about planting and running estates as he was most of the time with his uncle Susew de Soysa. He sought the hand of Catherine ,daughter of a Moratuwa wealthy family Chevalier Lindamlage Jusey de Silva and Weerahennadige Weerabala Jayasuriya Patabendige Anna Fernando on February 4,1863. After the marriage he resumed back to his business activities with the support of his intelligent wife. The family had a strong belief in Sinhala Medicine, the “Vederala” whom they went for consultation was living in a piece of land, which now the Prince of Wales College had been built. As the “Vederala” had got indebted, the particular piece of land was later sold to Jeronis which later used by C.H.de Soysa. The family most of the time was living in Colombo Bagatalle Walauwa later called Alfred House and during holidays they stayed in Moratuwa Walauwa. In anticipation of the visit to Sri Lanka by the Duke of Edinburgh K.G., G.C.M.G., G.C.S. I.P., second son of Queen Victoria, Charles Henry de Soysa and his other members of the family decided to extend a special invitation to him to a banquet to be hosted by him in honour of His Royal Highness at his residence Bagatalle Walauwa at Bambalapitiya. This invitation was accepted by the Royal family. The roads were decorated either side of the road from Galle Face to Alfred House and the then Government too extended their fullest co-operation. The day was April 22,1870. The Guests at the banquet were Maha Mudaliya Conrad Peter Dias Bandaranyake, uncle of Sir Solomon Dias Bandaranaike, Mudaliya Louis de Zoysa and Mudaliyar Rajapakse. Consequent to this event the Governor Sir Hercules Robinson intimated to the de Soysas the desire of His Royal Highness to confer the title of Gate Mudaliya on Susew de Soysa and of Justice of the Peace for the Island on C.H.de Soysa. The description of the Royal Visit was reported in the Ceylon Observer on April 23,1870. To commemorate the arrival of The Prince of Wales the eldest son of Queen Victoria and the Princess of Wales to Sri Lanka on December 1,1875 C.H.de Soysa decided to name the two colleges he was then building in Moratuwa as Prince and Princess of Wales Colleges. These two schools were built on a land of 15 acres. On the day of the formal opening of the two colleges, invitations were sent to a large number of distinguished guests. The opening ceremony was performed by Governor of Sri Lanka, Sir William Gregory on September 14,1876. This great day was celebrated by the people along the Galle Road from Colombo to Panadura as a festive occasion as the ceremonial opening of St.John's Church at Panadura had also been fixed for the same day. At 2 pm the Governor and his entourage accompanied by the Bishop of Colombo, Rt.Rev.R.S.Copleston along with C.H.de Soysa, Catherine de Soysa and other distinguished guests first arrived at Holy Emmanual Church, Moratuwa where a service was held. Thereafter, the gathering marched in procession to the college premises where the foundation stones were to be laid to the accompaniment of the Police Band. His Lordship the Bishop then addressed the gathering stating that it is a benefit to untold generations of students of Moratuwa. There onwards the Governor laid the foundation stone. Also he had the privilege of laying the foundation stone at St.John's Church, Panadura. The college function was followed by a grand reception at the Moratuwa Walauwa to all the Distinguished Guests. This philanthropist family other than the two schools, built roads, bridges (Lunawa) - Still it remains in the same structure -, resting places, schools churches - Holy Emmanuel Church, St. John's School, Panadura Hospital, St.John's church Panadura, tanks, ponds, St.Mathias’ church at Lakshapathiya, de Soysa Maternity Hospital a large donation to St.Thomas’ College, Mutwal where he studied and some schools in Jaffna, where and many more roads and buildings from Kandy to Colombo. In commemoration of the Jubilee of Queen Victoria, the Colombo Museum was built. The Medical Museum attached to the Medical College was ceremonially opened on December 9, 1879. His children were great writers of fables and poetry to the publications such as Heladiv Ruvana, Sathya Sanuchchaya, Lakmini Pahana, Dinakara, Sarasavi Sandares and Rivi Resa. On August 2,1890 Saturday early morning a dog crept into the Moratuwa Waluwa and when C.H. de Soysa had come down the stairs the dog jumped at him fiercely and when he caught hold of it by its neck, it bit his right hand. The news spread all from the highest to the poorest this sad news as they all knew that he was bitten by a rabid dog. As he refused to take Western Treatment as he had to leave to Paris, he depended on Sinhala Treatment which did not answer. The Great Philanthropist of Moratuwa passed away on September 29,1890 leaving behind great mementos and memories of buildings and roads for the use of general public. He died at the age of 52 years. The funeral Ceremony was held on October 1 1890. There had been massive crowds to pay their last respects to the noble soul, a national leader, a master and a great philanthropist. The crowds from all corners of the Island arrived to the Walauwa. Along the entire route from the Walauwa to the Holy Emmanuel Church, black flags were hoisted. The casket was placed in a horse-carriage drawn by four horses. On either side of the hearse walked Hon. F.R.Saunders, Government Agent, Western Province, W.Emilton, Mudaliya D.F.Wckremaratne Jayasuriya, J. Grenier, District Judge, Richard Morgan, Queeen's Counsel and George Alexander Dharmaratne, Barrister-at-Law. When the funeral procession arrived at the entrance to the Prince of Wales College, eight different representative groups carried the casket which was taken over pavada up to Holy Emmanuel Church. After the church service his casket was carried to the Cemetery and the body was laid to rest in the grave beside his son. The sad news of his death was carried in the “Ceylon Examiner” on September 30, 1890, The “Ceylon Independent” on October 1, 1890, London “The Times” on October 15, 1890, “The Graphic” on October 25, 1890, “St.Stephen's Review” on October 1890, “The evening Express” on October 7, 1890. 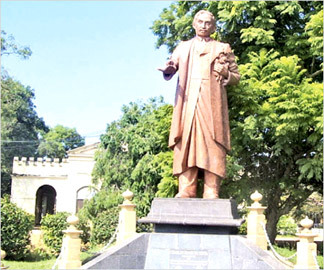 A statue in bronze of Charles Henry de Soysa was erected by grateful public in a most popular place in Colombo immediately opposite the Eye Hospital.